Voice: Last Sunday we lit the candle of joy. We light it and the candles of hope and peace again as we remember that Christ will come again and bring us everlasting peace and joy. A person lights the candles of hope, peace, and joy. 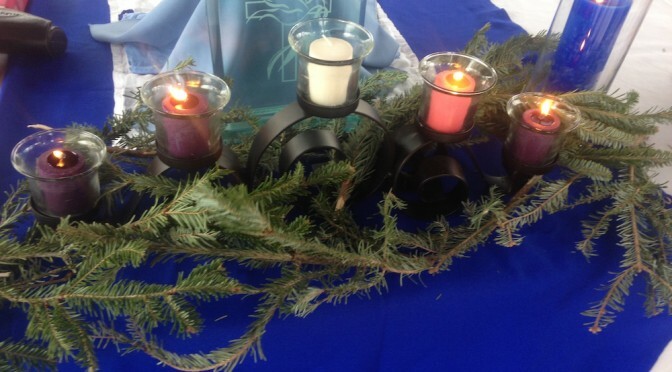 Voice: The fourth candle of Advent is the Candle of Love. It’s light is meant to remind us of the love that God has for us. Voice: Love is patient, love is kind and envies no one. Love is never boastful or conceited, rude or selfish. Love is not quick to take offense, it keeps no records of wrongs, it does not gloat over other people’s troubles, but rejoices in the right, the good, and the true. There is nothing that love cannot face, there is no limit to its faith, to its hope, to its endurance. Love never ends. Voice: We light this candle today to remind us of how God’s perfect love is found in Jesus. Voice: Let us pray. Loving God, we thank you for your gift of love – shown to us perfectly in Jesus Christ our Lord. Help us prepare our hearts to receive Him. Bless our worship. Help us to hear and do your word. We ask it in the name of the one born in Bethlehem. Amen.